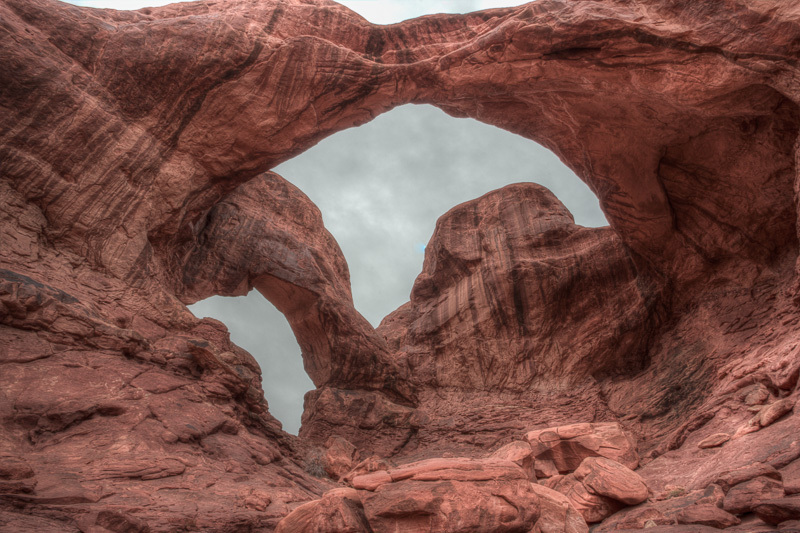 Double arch on a cloudy foggy morning. Not your typical photo here, I would have certainly taken typical, but this is one of those lemons/lemonade things. Not really sure if it's better, but it's definitely different than the usual. Processed fairly heavily to bring out the textures and detail in the sky. It is a great subject with a nice crisp capture. I keep thinking that if it wasn't such a tight crop, it would be a little more dramatic. You've got a lot of texture in the image, but I am not feeling very much dimension. Might be as simple as boosting contrast and darkening some shadows to make it come alive. May also be worth considering converting to black and white. That's really good and attractive image. Actually the original had a lot more contrast and saturation. I lowered both because it didn't have the feel that it did when I was there photographing it. The tight crop was chosen because the sky basically offered nothing, and because it was so bright it was overwhelming the arches. I had to fuse 3 photos to balance the sky out as it was. I hope to return with better weather. Congrats on the feature, EOSThree! This is a very interesting composition EOS ... I know how hard it is to get a new look on a well-photographed subject, and this one seems to be a winner Only thing I can decide on is whether I prefer the 'opening' at the top of the rocks to be cropped out or not. Do it Armando. Northern Arizona up into Utah is some incredible country. I had crappy rainy weather in Canyonlands and Arches, it made me work for it, and apparently it was worth it. I'll be going back for sure. To the OP: I like the image. The textures in the rock and clouds look great. I bet this would look really nice printed on a big canvas. I agree that if the sky isn't adding anything of value then don't include it.